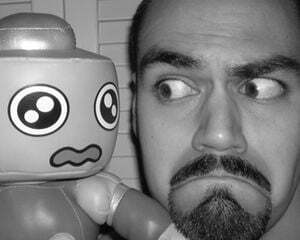 What does a Super Fighting Robot smell like? Mega Man air fresheners. 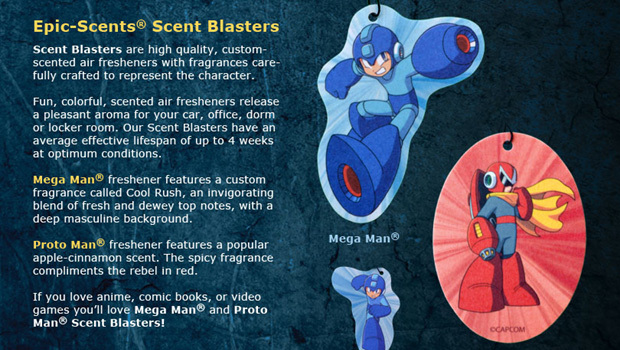 Let me repeat myself: Mega Man air fresheners. Well, I think we've just about seen everything, right? This fall, fragrance licensee (seriously) Epic-Scents will release Mega Man and Proto Man Scent Blasters. If you were curious, Mega Man smells like "an invigorating blend of fresh and dewey top notes, with a deep masculine background," while Proto Man carries a whiff of spicy apple-cinnamon. Now you know. To promote the new Scent Blasters, Epic-Scents is holding a contest on its Facebook page in which you can win the air fresheners (of course), a D-Arts Mega Man X figurine, and a 16GB iPad. So, yeah. Tonto, jump on it. You know you want your car to smell of an invigorating "Cool Rush."